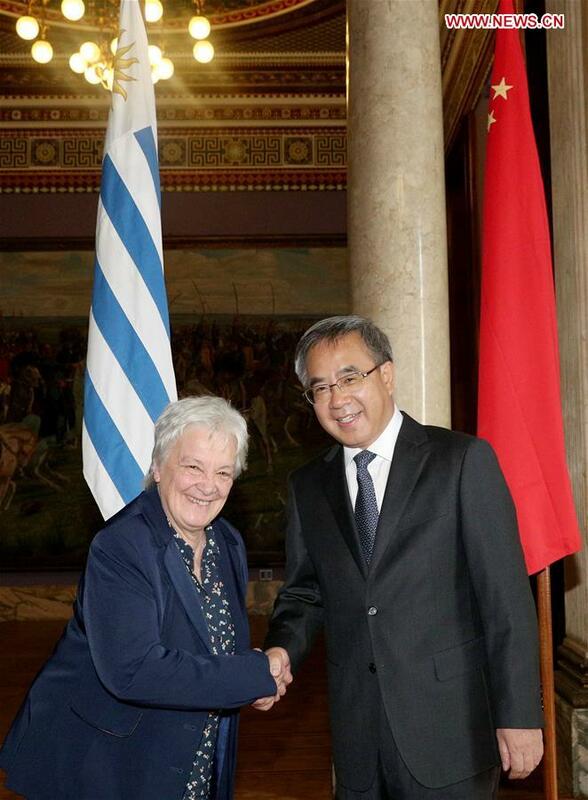 MONTEVIDEO, March 23 (Xinhua) -- China and Uruguay vow to work together to promote bilateral ties and deepen cooperation, visiting Chinese Vice Premier Hu Chunhua and Uruguayan Vice President Lucia Topolansky said in a meeting here on Saturday. Hu conveyed Chinese Vice President Wang Qishan's warm greetings to Topolansky, who is also president of the General Assembly and president of the Senate. Hu said that during Uruguayan President Tabare Vazquez's successful state visit to China in 2016, the two countries established their strategic partnership. Hu said President Xi Jinping sent him to visit Uruguay primarily to further implement the consensus reached by the two heads of states and to promote the continuous development of bilateral relations. Hu pointed out that Uruguay is the first country in the Southern Common Market (Mercosur) to sign a memorandum of understanding on the Belt and Road Initiative (BRI) with China. The regional bloc currently has four full members, namely Argentina, Brazil, Paraguay and Uruguay. Chinese and Uruguayan economies are highly complementary and have great potential for cooperation. It is hoped that both sides will work together to deepen bilateral cooperation in such fields as agriculture, infrastructure, industrial capacity and investment, Hu added. He said China is willing to strengthen cooperation with Uruguay in inspection and quarantine, fishery industry and food processing and logistics, among others, so as to constantly promote their agricultural cooperation. For her part, Topolansky said the bilateral relations between Uruguay and China have developed and deepened continuously over the past 30 years since the establishment of diplomatic ties. The Uruguayan side will take Hu's visit as an opportunity to implement the important consensus reached by the two heads of states and explore more opportunities for cooperation, said Topolansky. She said the two sides should strengthen pragmatic cooperation in areas such as the fishery industry, investment, culture and education based on mutual benefit and win-win situation. The Uruguayan side regards the BRI as an important platform and hopes to implement more cooperation projects under this framework, Topolansky added. On Saturday, Hu also met with Uruguayan Foreign Minister Rodolfo Nin Novoa. The two sides exchanged views on jointly building the Belt and Road, bilateral relations and the relations between China and Latin America.